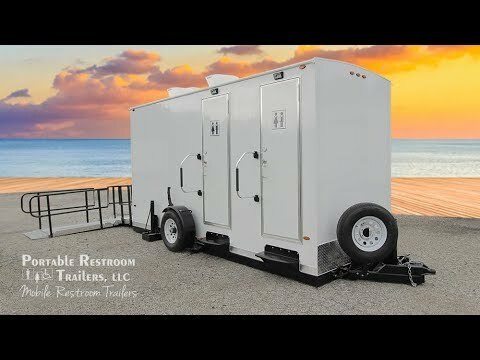 The well equipped ADA + 2 Portable Restrooms | Sanibel Beach Series offers all the amenities of home in any mobile environment. This unit features 2 standard unisex suites and one ADA Compliant unisex suite. The well-appointed interior offers easy-to-clean, earth-toned fiberglass walls, white framed mirrors, and warm vinyl tile floors. The unit is completely self-contained with a 300 gallon onboard waste tank and a 135-gallon onboard fresh water tank. Your guests will enjoy the climate controlled interior with a roof mounted low profile air conditioner and heat strips.